Does anyone remember the year 2006? We were all in elementary school still, or maybe just beginning middle school. Iphones were just created, and nowhere near the level they are today. Star Wars had ended the year before with a sour taste in everyone’s mouths. Oh yeah, and Pluto was downgraded from a planet in our solar system by the International Astronomical Union (AIU). Becasue Pluto hasn’t “cleared out the area” surrounding it, it cannot be classified as a planet. Since then, many people have simply not cared about Pluto, especially with us looking for life in other solar systems and sending robots (and perhaps soon humans) to Mars. However, an interesting article, maybe the first about Pluto in a long while, was published in the New York Times just yesterday. In it, it discusses some findings reported in the Journal Nature. Please note that while both of these articles are basically the same, I still would rely on the Nature journal further due to its background in science, and it going more in depth into what they found. I added both so you can see them, but we will be discussing the Nature journal from now on. Back in 2015, the sattelite New Horizons spotted what looked to be a heart shape (pictured above as the white part) in Pluto’s equator. Until now, they didn’t have an answer as to what this was or where it came from. After researching for over a year, they came to the conclusion that this heart shaped spot on Pluto is actually an enormous ice cap (over 1,000 km across and several miles deep)! I know what you’re thinking-does this prove that life could be possible on Pluto, because with ice comes water and water comes life? Well, it’s not guaaranteed The ice is mostly filled with nitrogen ice, making it not based off of water and no oxygen is present. So, if this doesn’t prove life on Pluto, why is it interesting? 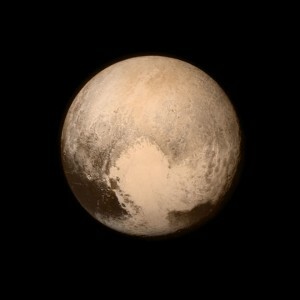 Well, this heart shaped ice cap has most likely messed with the dwarf planet’s rotation over time. This was most likely caused by meteor impacts, which is something that shaped our planet’s existence millions of years ago. When the rotation changes, it can affect the environment in drastic ways. 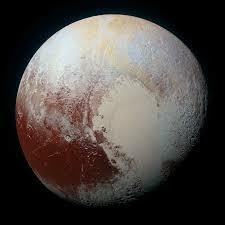 Because it is so vast, it moved Pluto’s rotation completely away from it’s moon, having NASA and the New York Times coin the phrase “Pluto is finding its heart”. Likewise, this huge ice zone (what NASA named Sputnick Planitia) also affects Pluto’s atmosphere greatly. As I mentioned above, this ice sheet is made mostly of nitrogen, carbon, and methane. When Pluto warms, it goes into the atmosphere, creating a harsh environment, until it is brought back down to the surface with a new layer of frost. This is important because it’s literally changing the atmosphere of Pluto as we speak (much like how too much carbon in our atmosphere is warming our planet at a fast rate). So, we have to be the clear about what this could mean for us as humans in the future. Not only do we more understand how Pluto’s atmosphere works, but we also can determine how Pluto is being affected by this “ice shape”, and it it’s rotation is being affected. Likewise, although it seems unlikely, scientists in the New York Times article do suggest that there may be an ocean of water underneath the surface of Pluto, not an ice sheet. If that’s the case, that could lead to the possibility of life on Pluto, although it is unlikely due to the significant low temperatures there. With us so heavily focued on life in other galaxies, it would be interesting to check Pluto out first to rule out this possiblity before moving onward. However, I think it’ll most likely be like Mars and show possible old signs of life, but nothing currently there. Still, having something to care about regarding Pluto is a pleasent changed of pace indeed. This entry was posted in Uncategorized on November 17, 2016 by Isaac Orndorff. I remember when Pluto was downgraded from a planet. I was only in third grade and I can recall my science teacher’s excitement about the topic. I didn’t recall why it was downgraded, so your post and links helped to provide that background. This is an interesting topic because it is something you don’t hear about much anymore, possibly because of the new craze about traveling to Mars. However, this post did not have a hypothesis that was being tested; it simply stated facts and reference material. I think that if you focused on the possibility of life on Pluto and proved or disproved it, your post would be much stronger. This post grabbed my attention because it is a topic that I find interesting, so, just a little bit more elaboration would create a “world” of difference and new perspective. I did some research and found this article from NASA, https://www.nasa.gov/exploration/whyweexplore/Why_We_23.html, which provides more information on Pluto.